We are closing our Store and look what we just discovered! 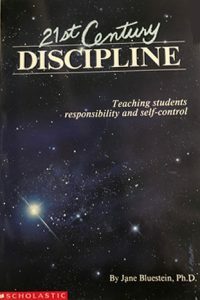 We just found a small stack of the original copies of 21st Century Discipline—the final printing by the publisher who mis-spelled “Disipline” on the spine of the book—truly a collector’s item. And… it’s free for the cost of shipping it to you. We’re clearing the warehouse and would love to share this book with people who can appreciate my earliest work. Although my writing, thinking, and even vocabulary have evolved over the years, this book bridged the earlier strategies I learned in my training, and the win-win approach that was starting to emerge here. This book may be especially valuable for someone who is still working with a win-lose, rules-and-punishment mindset and having a hard time finding a middle ground. Use your credit card or PayPal account to order 21st Century Discipline through a secure server online. Ask for an autograph. It’s free, too! Get a collectible copy of the original best-selling classic book, including a misspelling on the spine! Cover image is just a placeholder. The book is free. The price helps cover the cost of shipping. Other free books available on this site.